is designed to fit the foot. Just like the feet, with its complex network of bones, ligaments, and tendons, well-made shoes are constructed with many parts that work together to create comfort for the feet. Poor construction and inferior materials make the difference between feet that feel great and feet that hurt. Upper—This is the part of the shoe that people see. It is the “body” of the shoe that surrounds the foot. Vamp—The front section of the upper. It goes over the toes and part of the instep. Quarter—The back section of the upper covering the heel. Tongue—This part of the shoe can vary in design, but its purpose is to protect the foot from debris. The tongue can be formed by the vamp, or it can be stitched into the shoe. The apron tongue is often seen on athletic shoes such as those used in golf. The bellows tongue serves a similar purpose of keeping foreign objects away from the feet, and it is stitched into the shoe. Toe Cap—Not all shoes have toe caps, but this piece of leather or metal is placed over the vamp in the area of the toes. It provides reinforcement and protection. While the upper is easily seen and assessed, the internal structure of the shoe is important as well. Counter—Found in the heel, this part of the shoe helps to hold its shape and offers stability to the feet. Toe Box—Providing structure, shape, and protection to the toes, this area is very important for comfort. A narrow toe box can cause and aggravate foot conditions such as corns, ingrown toenails, and bunions. Shankpiece—Sitting between the insole and the outsole, it can be made of a variety of materials. Its purpose is to provide shape to the shoe and support to the foot. The Sole—this is the bottom part of the shoe and consists of three parts. Outsole—The visible bottom part of the shoe is called the outsole. It is often made of rubber, although leather is sometimes used. The purpose of the outsole is to provide grip, stability, and protection. Midsole—Fitted in the middle of the three soles, this piece adds to the thickness giving shoes a more sturdy appearance. Insole—Commonly misunderstood, the insole is not the same as an insert. This part of the shoe holds the other pieces together, and is attached to the shoe with stitching, glue, or staples. Heel—Whether high or low, this part of the shoe is attached to the outsole, and provides balance and height. Well-made, supportive shoes give your feet the comfort that they deserve. 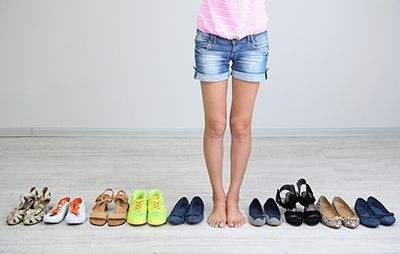 If your shoes cause foot pain, it’s time for a new pair. Before you shop, see Drs. Joel Brook and David Northcutt for a thorough evaluation of your feet. They will help you to understand your unique foot type, and advise you on the best shoes and orthotics for your needs. Call our Dallas or Plano, TX offices today, or schedule an appointment online.